Making our places look nice always falls short in one aspect: What do we do with all our stuff? You know those skis that you only use a few months out of the year? They would make a nice accent for your entryway. Or those guitars that you always stash in the corner? They would look nice on your wall. There are many different ways to integrate functional items into your décor, and today I’m going give you some tips on how to do that. 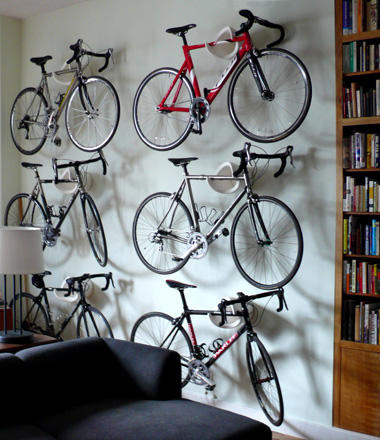 If you have a bike, try mounting it on the wall. 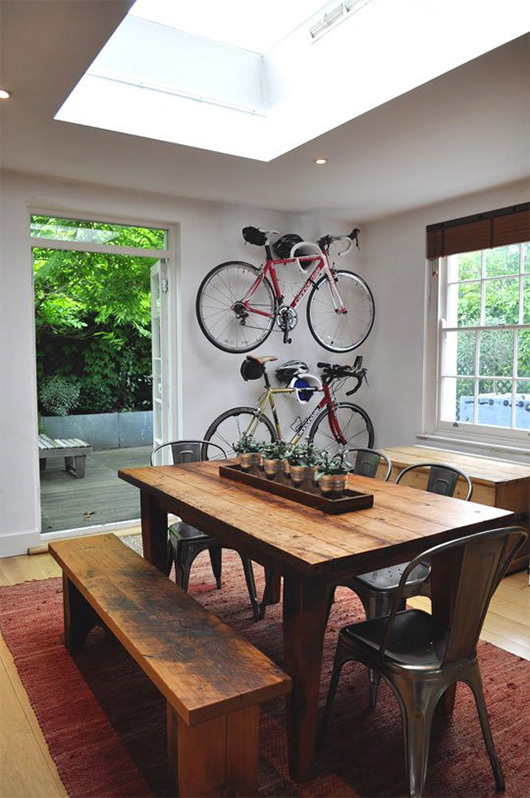 To help incorporate it into the rest of the room, try matching some accents to the bike. 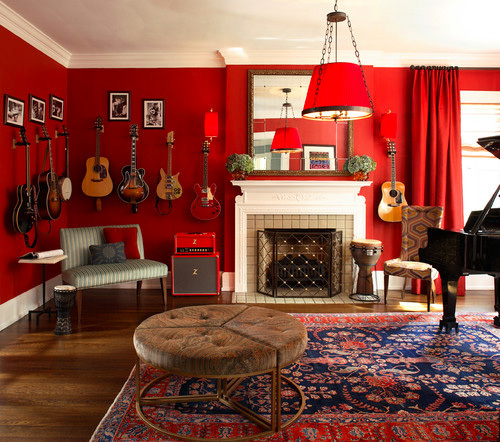 For example, if you decide to hang your red bike on the wall behind the sofa, buy a couple of red accent pillows. This will make the bike seem like it’s a part of the space, rather than an afterthought. And you don’t have to stop at one – take a peak at the photos below for inspiration. 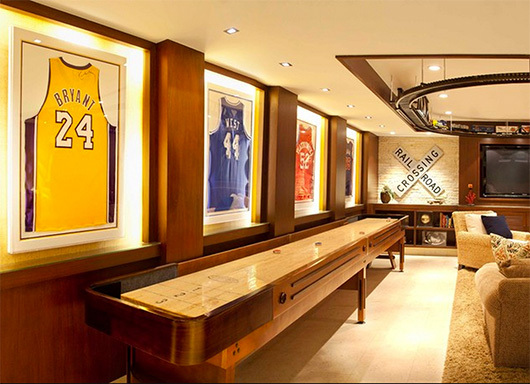 Sports memorabilia will look great too, if you do it strategically. A failsafe technique is to group similar items together, as shown below. Do you have some autographed basketballs? Group them together on a shelf. If you’re framing jerseys or other flat items, but sure to use the same type of frame for each piece to be consistent. 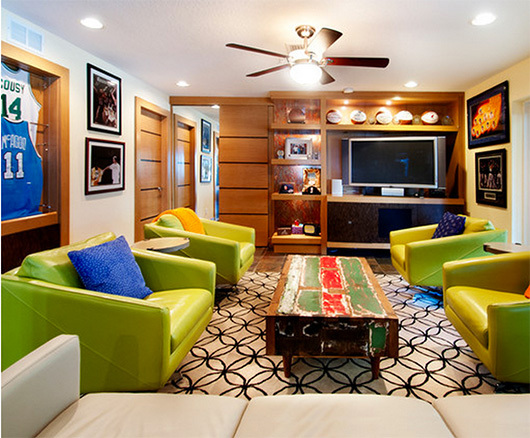 Again, try to coordinate the jersey colors with other pieces in the room. 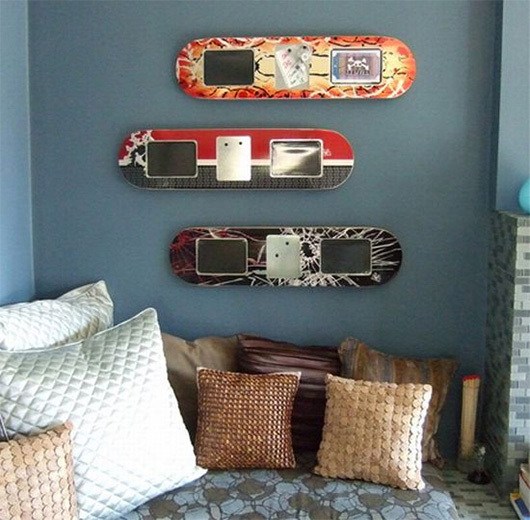 Functional pieces like show shoes, skis and skateboards all look great mounted on the wall too. Grouping like items together as a collection is the easiest way to achieve a cohesive look. 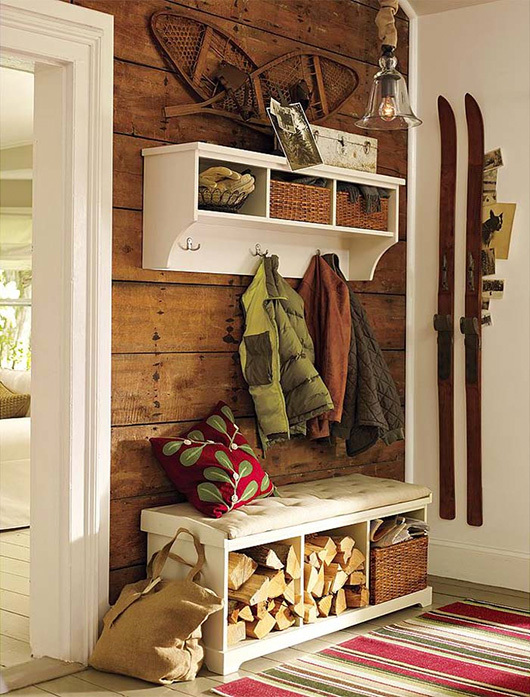 In the image below, the snow shoes and skis sit alongside other winter clothing – fitting in nicely with their surroundings. 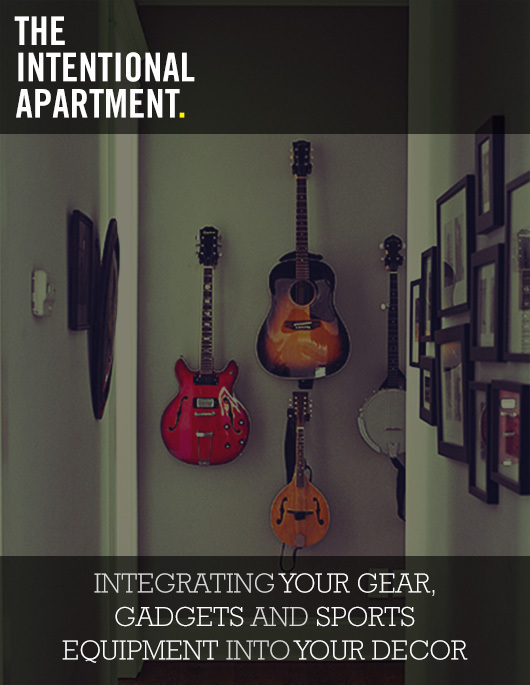 And another benefit: if you have a small apartment, mounting your gear will free up some extra storage space. If you own a surfboard, you know that they take up a lot of space – so why not make them as functional indoors as they are out in the ocean? One option, as shown below, is to flip it upside down and use it as a coffee table. Hanging a few on the wall is another appealing idea. This is a great way to infuse a bit of personality into your space… talk about a conversation starter! People often prop their guitars up in the corner, or stash them away in a closet… but a guitar is a beautiful instrument, so why not show it off? As you can see from the photos below, they look nice in groups or alone – just make sure to pick a smaller wall if you’re only mounting one. 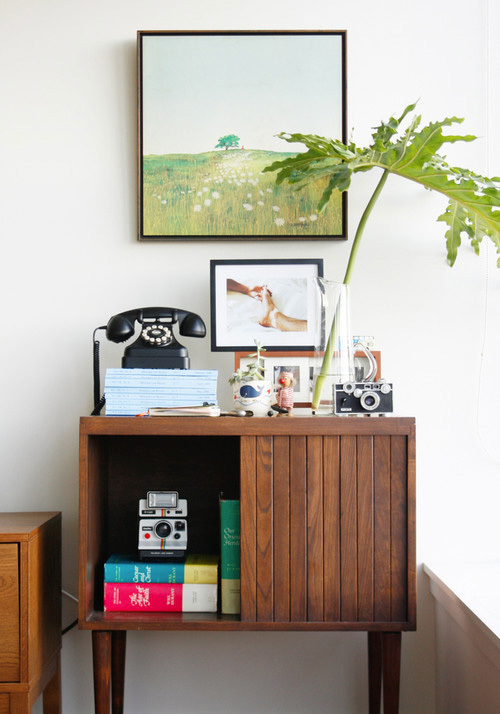 A camera collection can be an interesting accent for a bookshelf (or even on the wall as shown below). And they don’t necessarily have to be vintage cameras… if photography is a hobby of yours, don’t shy away from exhibiting the cameras that you currently use. 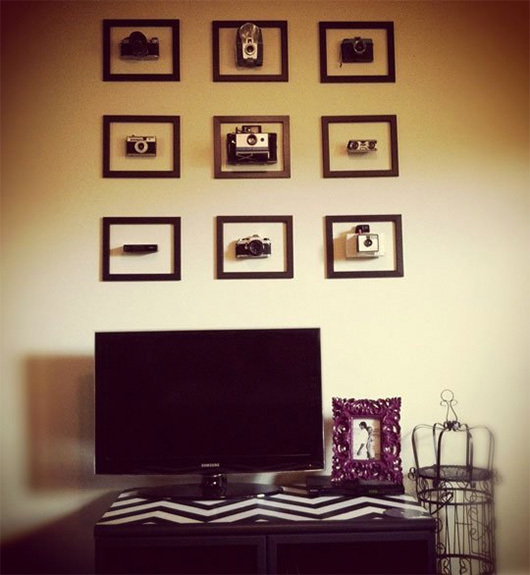 Consider hanging a few of your framed photographs above the cameras to create a themed space. If you have collectibles such as action figures and vinyl toys, think about displaying them in a unique way. Lots of people put them on a shelf, but not everyone organizes them by color. This interesting display technique will attract attention in and of itself. Or you could hang each and every toy on its own mini shelf… this is a good way to fill up a whole wall. DVDs aren’t the most attractive collection, but most everyone has one. So why not present it in an interesting way? Again, color-coding can be a cool way to transform a purely functional collection into a visually interesting one. 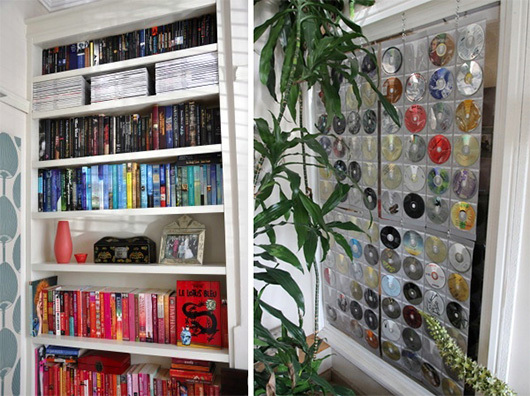 Or for a seriously unique look, use plastic DVD sleeves to make a curtain for your window! So as you can see, there’s no reason to hide your gear, gadgets and sports equipment. 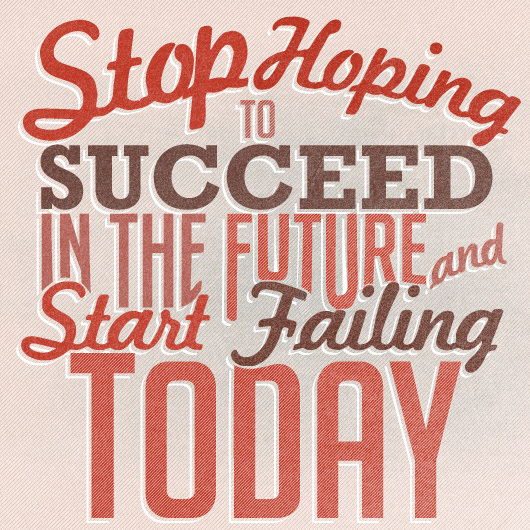 Be experimental, and think outside the box. There are plenty of other things collecting dust in your closet that could probably be displayed on your wall… with a little bit of thought and ingenuity, it is possible to use most anything as décor. Is it just me.. or is every reference for “as shown above” supposed to be “as shown below”? The Intentional Apt posts are probably my favorite. Great job, Faith! 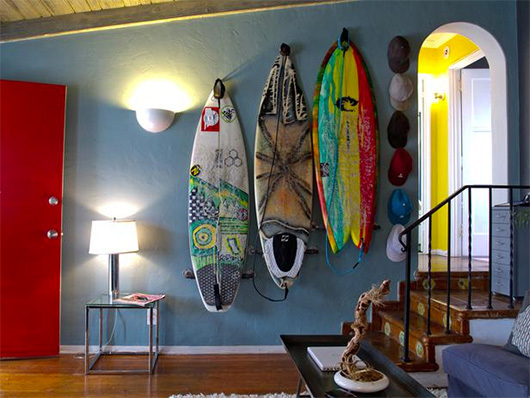 Hanging surfboards on wall racks is a great idea! 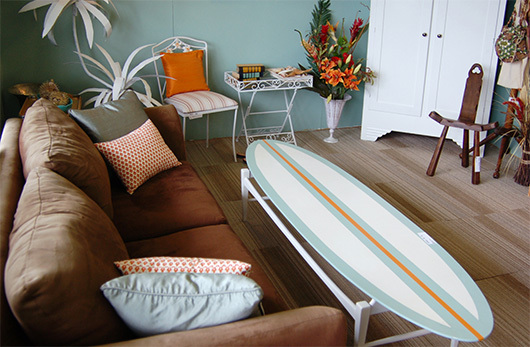 If you want to go the coffee-table route, however, it’s best to use a retired or broken board because it risks a lot of damage to the board’s composite skin. please do more international apartment articles!! 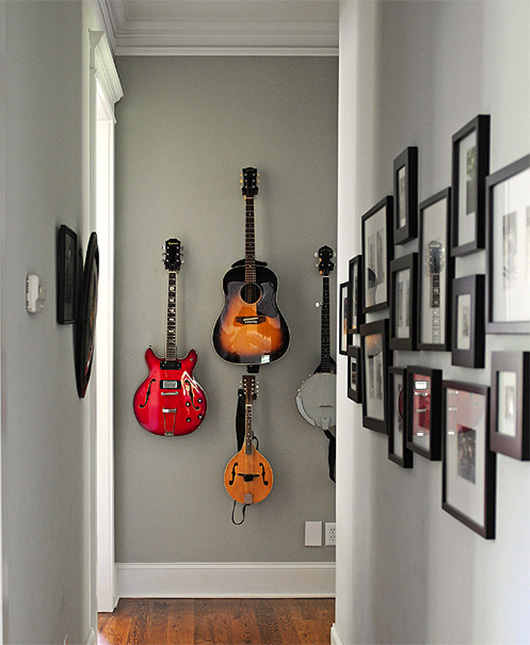 About hanging guitars – make sure they will never be in direct sunlight. That is a really easy way to completely ruin a big investment. As a drummer with currently no space to set-up and practice (apartment living), any thoughts on how to display a drum set? I have some open wall space that would be perfect, but am struggling with the implementation. It may be possible to use some black iron pipes mounted on studs to create a “shelf” for each drum. You’d probably want to cover the iron pipes with a black foam to protect the finish of the drums though. Another idea would be to hang netting/rope from ceiling rafters or a pully near enough to the wall for the bottoms/backs to rest against it and then keep a drum in each or a vertical configuration. I like it! Thanks for the suggestions. I was also considering just painting some MDF and setting each drum on a separate shelf. I’ll experiment a bit. My ideal location is a corner, which makes things a bit more complicated. You could find 45° fittings and that would give you the angle to make a corner mount workable. Just ensure you’re screwing into studs! What are those white racks that the bikes are hanging on? Anyone know where to find them? look up cycloc, looks slightly different than the exact item, but they’re all over the place in sf offices. So how should I display all my running shoes?